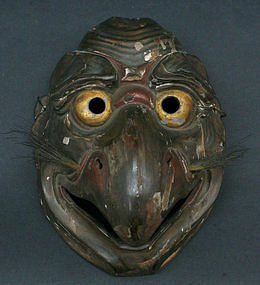 Edo Period Kyogen Theater Karura (Garuda) Mask, donated in the 19th Century by the prominent collector, Dr. C.G. Weld to the Museum of Fine Arts in Boston. Karura is a mythical fire-breathing bird-human creature from Buddhist-Hinduist mythology. A fine and rare example. Wood with lacquer. 8 x 6.25 inches, 20.5 x 16 cm. 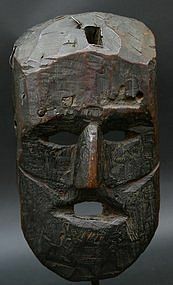 Old and Primitive Nepalese Mask with a Great Patina. 11.5h x 6.5w inches, 29h x 16.5w cm. 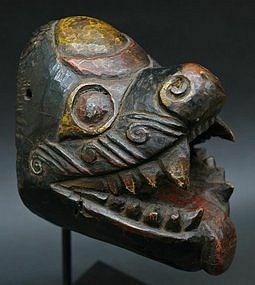 Old Nepalese Boar Mask. Purchased 40 years ago in Kathmandu by a well-known and widely published collector. 6.5h x 5w x 6d inches, 16.5h x 12.5w x 15d cm. 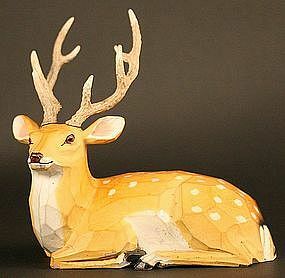 A wonderful signed Kibori (single chop carving) Okimono of a Stag by the renowned Ika Goyo, beautifully painted in delicate tones, with removable antlers carved of horn. Original box is included. 7 x 7 x 7 inches, 18 x 18 x 18 cm. 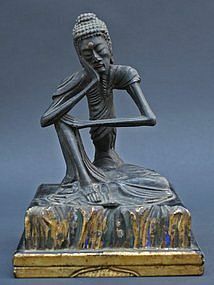 Charming Japanese Bronze Sculpture of Yamauba,19th Cty. 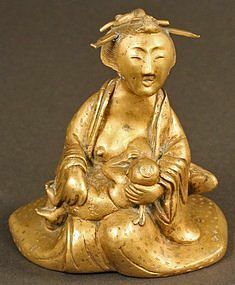 A small, arresting late 19th Century Japanese bronze sculpture of Yamauba, breast feeding Kintaro. The mythology is Kintaro was left is the forest by his father to save him from his enemies. 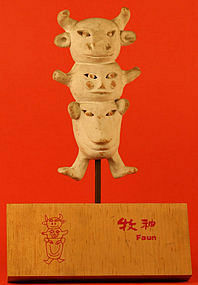 He was found by Yamauba, the forest goddess, who nursed him to grow to become the Hercules of Japan. This charming bronze has wonderful detail. 4 inches (10cm) high x 3.25 inches (8.5cm) wide. 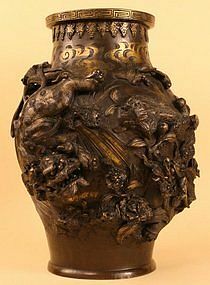 Extraordinary Japanese Antique Bronze Vessel featuring very high relief of a Hawk, a pair of Shishi, and foliage in a classic form. Strong, naturally rendered images with a rich patina and finely rendered detail. Original gold patina. A fine addition for bronze fanciers. Edo Period, early 19th Century. 11.5 inches (29cm) high x 28 inches (71cm) circumference. 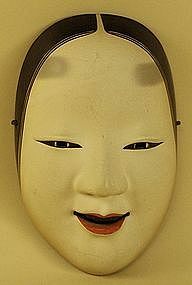 Late 19th Century Japanese signed Noh theater Mask of Okame, the Goddess of Mirth, a very popular image in Japanese culture. A beautiful example of this type of mask done by a master carver, using Cypress wood (Hinoki) and many layers of Gofun, crushed oyster shell lacquer. A very charming and well rendered image. 8.25 inches (21cm) high x 5.25 inches (13.5) wide. 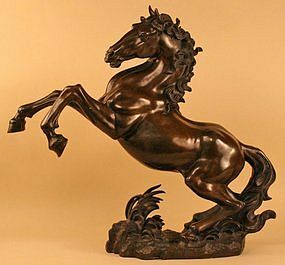 A spectacular 19th Century Japanese Bronze Horse, with a wonderful dark caramel brown patina, featuring a classic Japanese wave design in the mane and tail. This important bronze is a masterpiece of the finest quality. 21 inches (53.5cm) wide x 18 inches (46cm) high. 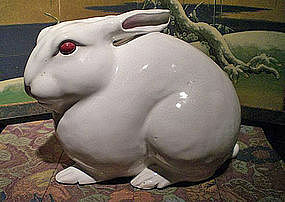 White Rabbit Ceramic Sculpture by Takegawa Chikusai (1809-1882), created in his final year, 1882. Takegawa Chikusai was responsible for putting Banko Yaki, and the Banko-gama kiln (established 1829) and its home of Yokkaichi City in Mie-ken back on its feet and on the map. Banko Yaki had previously been made in the early Edo Period in Kyoto. Takegawa Chikusai's work was bequeathed to the Yokkaichi Museum's permanent collection, so this is an extremely rare opportunity for you to own a masterpiece by this great artist. 11 x 7.5 inches, 28 x 19 cm. Excellent Condition. Signed with original box and inscriptions on the lid of the box. 19th Century Meiji Period Japanese Noh Theater Mask of Okina, the Happy Old Man, portraying a happy man of wisdom and joy in many Noh dramas. This Noh mask is carved by Ko-Ikiu III from a long line of Noh mask carvers. It is finely lacquered over paloma wood. Signed with original case. This mask is in Perfect Condition. 7.5 inches tall (15 inches with beard) x 6 inches wide, 19cm tall (38cm with beard) x 15cm wide. Meiji Period Japanese Bronze Sculpture of Senju Kannon, the 1,000 armed Bosatsu of Compassion, the deity of pure bounty, omniscient and omnipresent. This divine sculpture holds its foremost hands in the Anjali mudra (hand position), universally used by people in Asia for salutation, it evokes an offering (of one's good feelings, of one's person, of art, etc.). This is a fantastic, masterfully rendered find for the Buddhist art collector. 13.5 inches, 34 cm. Excellent Condition. 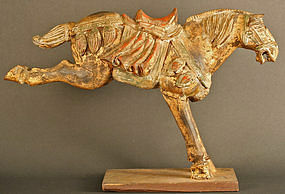 Late 18th, Early 19th Century Edo Period Japanese Wood Horse Sculpture in a galloping pose. The horse still has a good amount of its original colors and gold gilt. It would have been offered as a gift to a Shinto shrine from someone with the means to afford more than the usual horse plaque, but not quite the means to afford to give a real horse to the shrine, a gift only the most wealthy could afford to give. A wonderfully rendered sculpture and a special image for equestrian art collectors. 20 x 13.5 inches, 51 x 34 cm. Very Good Condition. 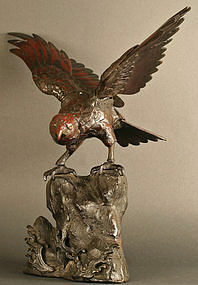 19th Century Meiji Period Japanese Bronze Sculpture of a Falcon with open wings landing on a rock with waves. This is an exciting work, featuring one of the most revered birds of Japan. The falcon's deep gaze pulls you in. 19h x 20.5w inches, 48h x 52w cm. Excellent Condition. 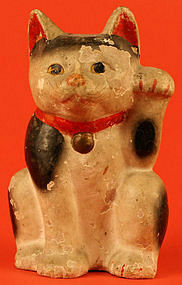 Early Meiji Maneki Neko (Beckoning Cat), believed to bring wealth and good luck, from the collection of a renowned author on and collector of Asian art. The fur is white with random black and orange patches. This tri-coloring is considered especially lucky. This belief may be related to the rarity of this coloring in the Japanese bobtail cats, after which the Maneki Neko is modeled. This coloring is called Mi-ke in Japanese, meaning three-fur. 7.5 inches, 19 cm tall. 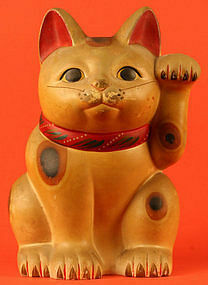 Early Meiji Maneki Neko (Beckoning Cat), believed to bring wealth and good luck, from the collection of a renowned author on and collector of Asian art. The fur is white with random black and orange patches. This tri-coloring is considered especially lucky. This belief may be related to the rarity of this coloring in the Japanese bobtail cats, after which the Maneki Neko is modeled. This coloring is called Mi-ke in Japanese, meaning three-fur. 10 inches, 25.5 cm tall.